so as you can see in the photos in the previous post, i had enough red squares to make the afghan. PHOTOGRAPHIC EVIDENCE! 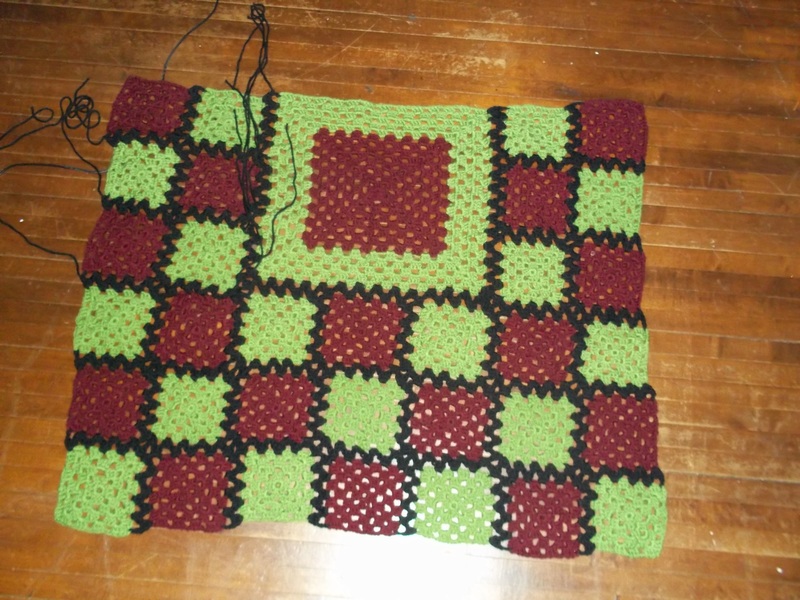 JUST enough – joann ran out of that yarn, and so i based the size of the afghan on that number of red squares. i have made a TON of progress since the last update – i’ve been merrily weaving in ends and joining squares, and then…a red square went missing. we’ve torn the place apart looking for it (ok, well, not quite. but we have looked really hard!) and my mom even looked at her house, since i brought some with a couple weeks ago and worked on them there. no luck. big deal, you say – just go to the store and buy more! but alas, there is no joann fabric here. and the yarn, you see…it’s the freakin’ joann fabric BRAND of yarn, of course, so you can’t get it anywhere else. i tried using red heart as a substitute and it was all wrong. it probably would have bothered me every day until the day i die if i had used it. it is scratchier, a little darker, and a little thicker. this is the most elaborate afghan i’ve ever made, and it’s 100% original; no way i’m cutting corners on it! so, i gave up on locating the missing square and went online, where luckily joann fabric had the right color in stock. i had even mentally prepared myself to pay their ridiculous $5.95 shipping fee when i remembered that i get their emails – lo and behold, a coupon for $2.95 shipping! so at the end of the day, it will cost me $7.32 for one granny square. i almost bought more just to make it worth the shipping and so i’d have enough for another project, but decided against it. i also just realized, as i typed the last sentence, that i used the same yarn to make a vest that i will probably never, ever wear and i should have just frogged that and used it. whoops. hindsight is 20/20. before i had that realization, i was going to say that i just got an email that it has shipped, which means i will probably find the original square in the next 24 hours. well, now that you’ve stayed with me for this long-winded story, you at least deserve to see an updated photo, don’t you? This entry was posted in Crochet and tagged afghan, crochet, granny square. Bookmark the permalink.